It's probably best to begin by clarifying that the "seeds" we're saving are actually the beans themselves. When you grow beans for dry beans, you allow the pods to turn brown and dry on the vine before harvesting. This is the same basic principle. In this article, we'll talk about saving seed for snap beans, string beans, wax beans, kidney beans, and all other dry beans. Save from open-pollinated or heirloom varieties: These varieties come true from seed, so you'll be sure the beans are the same quality as the plant you saved the seeds from. Saving from hybrid beans is not a sure thing -- the beans you get as a result can often be quite different from those produced by the original plant. Let the pods dry: Once you start letting the pods dry so that you can save seeds, the plant will stop producing pods. This is something to keep in mind. You may want to set aside a few plants just to be your "seed saving stock" and keep the rest of your plants producing as long as possible (this is less important if you're growing bush beans, which produce a harvest all at the same time anyway. But it's a good idea if you're growing pole beans. If you are planning to save seeds from your beans, try to avoid planting two different varieties side by side. Though bean blossoms are perfect flowers and self-pollinate, varieties can cross if they are planted in very close proximity. One way to try to avoid crossing via bees or other pollinating insects is to be sure that there are plenty of other flowers planted nearby to attract pollinators so they'll be more likely to ignore your bean blossoms. If that is not possible, you can try bagging each blossom in a Remay or spun polyester fabric bag (though that is time consuming) or build screen cages over beds of bush beans to isolate them. The best option is probably to just grow only one variety at a time if your goal is to save seed. Bean seeds are ready to harvest when the pods are dry and kind of crunchy. You can either pick dried pods individually from the plant when they are ready or pull up the entire plant right before a frost and harvest the pods that way. If you pull up the entire plant, you can hang it in a sheltered location (such as a garage or basement) and the pods will continue maturing for a while. The Feed Sack (or Pillow Case) Method: To use this method, place all of your bean pods in a sack or pillowcase, then repeatedly smack it against the inside of a large bucket or even against a wall or fence. This will dislodge the beans from the pods. Pick out the beans and compost the chaff and other debris. The Tarp Method: Lay out your beans on a tarp or blanket and either walk over them or roll the tarp up and roll it back and forth to separate the beans and husks. By Hand: If you don't have many beans to process, you can simply open the pods and remove the beans by hand. Store your beans in a cool, dry place, such as a refrigerator or unheated basement. Beans remain viable for approximately four years after harvest. 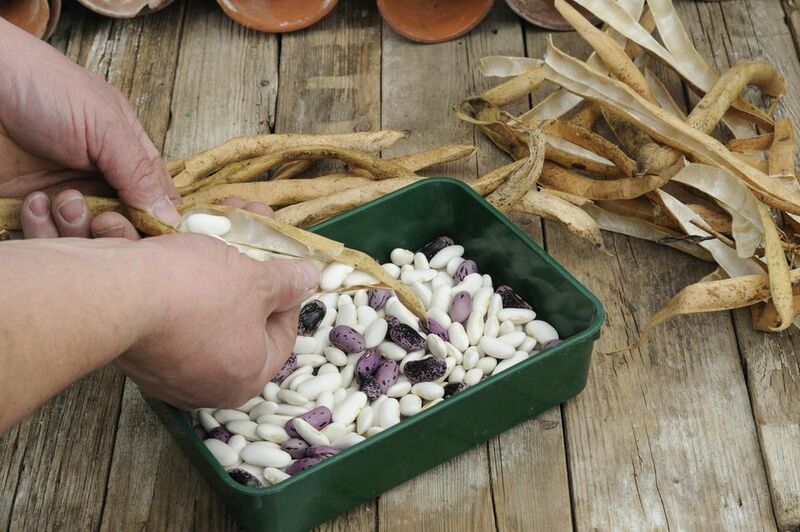 Saving beans to plant next year is an easy, frugal way to keep growing your favorite varieties.